That’s why Game Of Thrones’ viewers have spent years theorizing different ways the White Walkers might make it past the Seven Kingdoms’ largest line of defense, a debate that just got rocked by a big ole ice javelin. Because now that the Night King has his own dragon, he seems to have new options to get by the Wall, despite its magical protections, spells, and charms that Benjen “Coldhands” Stark told Bran and Meera have thus far prevented the dead from passing through. So before Sunday’s season-seven finale, here are the ways we think the White Walkers might finally make their way into Westeros, from the most plausible methods to the least. Westerosi legends tell of ice dragons whose cold breath freezes men as quickly as dragonflame melts them, but there are no stories of fire-breathing dragons being raised by the Night King. We have no idea what to expect when the newest member of the White Walkers army opens his massive mouth. Will fire come out or ice? If the wight Viserion still breathes fire (especially if it’s blue—that’s the hottest part of a flame! ), that could mean the Night King can forget about going over or around the Wall; he can simply command his dragon to melt a hole in it. Dragons are tied to magic—they are likely magical themselves—which could overcome the spells that are in the Wall. This goes right to the top, because what’s the point of giving the Night King a dragon if he can’t use it for his biggest problem? The Night King will fly over it on Viserion, destroying the Wall’s protective magic. If Viserion breathes ice and not fire, the Night King might use him to fly over the Wall without ever having to touch it, an option the Wall’s builders never could have envisioned. Once he makes it over, that might eliminate the magic that has kept the dead from passing through, allowing the wights to climb it like the wildlings, sail around on the sea, or march through a tunnel or hole. If when the dead finally get to the Wall we see a wight or White Walker touch it and explode, this is what we’ll expect to happen. The Night King’s “mark” on Bran still works, so the White Walkers can pass through already. The White Walkers were able to get past the magic of the Three-Eyed Raven’s lair after the Night King touched Bran in a vision. That “branding” nullified the special charms keeping them out, but was it more than a one-time deal? Now that Bran is in Winterfell, does that mean the Night King can still follow? It makes a lot of sense story-wise, especially the part where Bran has been completely useless this season. Of course, they’d still have to overcome the physical protection of the Wall, but they can just break through one of its many tunnels. We saw during the Battle Of Castle Black that giants are strong enough to lift the heavy gates, and the Night King has at least three dead giants with him. They can pick it up, allowing the rest of the wights to pass through with ease. They’ll walk around it on the frozen seas near Eastwatch. Because Game Of Thrones fans don’t miss a beat, sharp-eyed viewers noticed that this season’s opening credits continued the pattern of making the ice near the Wall bigger and wider, including what looks like the Shivering Sea freezing over near Eastwatch. Is that why the White Walkers were headed there? Is the solution to getting past the Wall’s magic as easy as going around it? There is real evidence for this, but it would be historically lame, as though the White Walkers got by on a technicality. You should not be able to defeat magic by loophole. That was true before the Night King had a dragon, but it would be even more disappointing now. They will climb over it (with those stupid chains) or make a wight ramp, à la World War Z.
We’re putting these together because they are similar. Now that we know the Night King has a limitless Home Depot credit card, maybe the giant chains he got there to pull Viserion from the lake can be used to go over the Wall. Viserion can fly up and drop the chains at the top, and the wights can climb up and over. Or maybe one of the reasons the White Walkers needed such a massive army was because they are planning to use their massive numbers to form a ramp out of their bodies. We have seen the wights throw themselves off cliffs, and they started to climb on one another to get to the top of that conveniently placed rock during the frozen-lake battle. Going over the magical Wall (without a dragon) is as lame as going around it, but either of these methods would be aesthetically superior to see—there’s just little evidence either will happen. The show will suddenly remember about the Horn Of Joramun. The most popular theory from the novels involves the famed Horn Of Winter, also known as the Horn Of Joramun. Joramun was the King-Beyond-The-Wall who joined forces with the Stark King Of Winter to defeat the infamous Lord Commander known as the Night’s King. 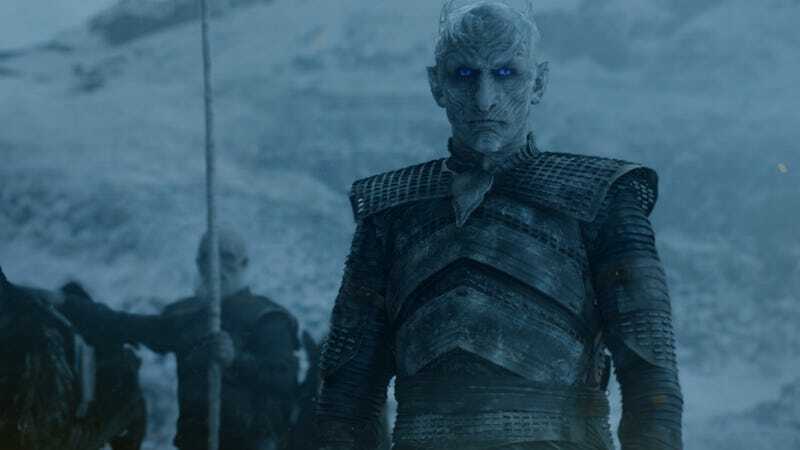 The Night’s King left his post to be with someone who sounds like a White Walker woman, and the two reigned for 13 years from the Nightfort until they were stopped. Joramun has a deep connection to events at the Wall, which gives more credence to the legend that says his horn will bring down the entire Wall if blown. The books have talked about it a lot, but the show never has. The closest we got was Sam finding an old horn in that bag of dragonglass at the Fist Of The First Men, but it was never brought up again. The only thing worse than the show forgetting about the Horn Of Joramun would be to suddenly introduce it as a deus ex machina now. Although, this season has been fond of doing just that, so this might be more plausible than we want. They will. The White Walkers are getting past the Wall this week.